What To Do With Your Smartphone While You're Having Dinner : All Tech Considered Norms around what we're supposed to do with our digital devices at mealtime — and during other human interactions — are changing. Where do you draw the line on smartphone use? Where do you draw the line on smartphone use? There was a time when checking your smartphone at the dinner table was considered offensive. But social norms and behaviors change as we adapt to technologies. Heck, that's the whole central theme of this blog. Not long ago, I found myself at dinner with young political reporters from a Washington-publication-I-won't-name and felt oddly isolated despite being at a table with a dozen people. Why? I was the only one without a phone in hand, compulsively checking it for most of the meal. "Ninety percent of Grenny's respondents reported that their friends or family have stopped paying attention to them at least once a week because of a digital device. Twenty-five percent said EDIs have caused 'a serious rift' with a friend or relative. More than half have witnessed an EDI when they were talking in person to a customer service representative." The report is based on an unscientific survey, we realize. But it raises questions I want to put to you: Does it create divisiveness in your relationships when your companion is more entranced by his or her phone, or would you prefer that we all accepted smartphone checking as a reality? Why? 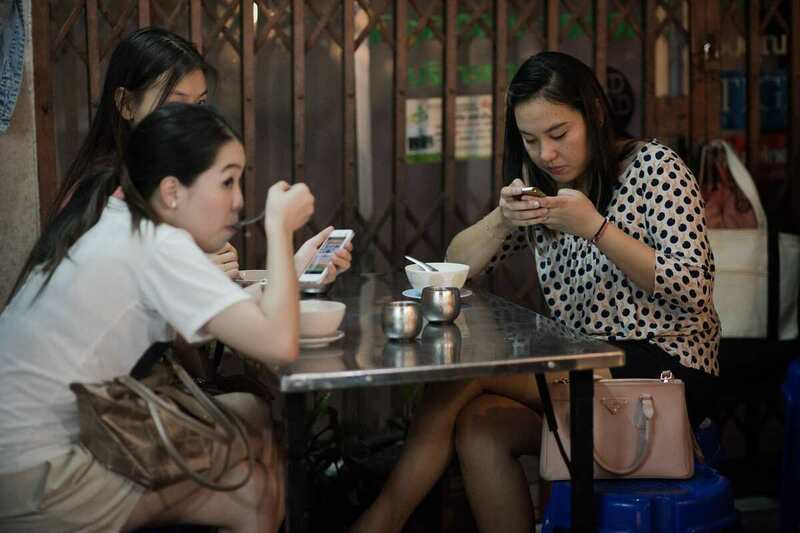 What kind of social norms are acceptable when it comes to smartphone use in gathering places? Are they OK at parties but not in the movie theater? Is this completely situational, i.e., might as well have dinner with your phone if everyone at the table is? Many social practices around how we use technology aren't necessarily agreed upon before they become norms. For example, there wasn't a moment we collectively decided that we are "always on" or available to respond quickly to text messages. Yet, we expect it from people we text. So, what are the boundaries — if any — that we should expect for smartphone engagement during face-to-face human interactions? The more I cover technology and society, the more conscious I've become about how much control my devices have over me. It's real work to just be present in the moment, as David Foster Wallace so beautifully described in his famous "This Is Water" commencement speech. So this transition point we're in, in which smartphones or other devices are really becoming our primary companions for most of our waking hours, is a fascinating one. Let's explore it over a series of posts. Leave your thoughts in the comments, send me a note on Facebook or Twitter or fill out this Google form, and I'll include your thoughts as we explore these norms going forward.